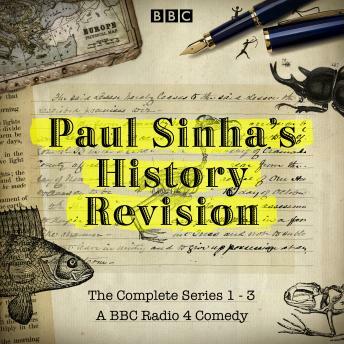 In his fascinating and hilarious BBC Radio 4 stand up show, comedian and quizzer Paul Sinha shines a light on the important historical moments that you never got taught at school, and explains why so much of what you did learn is wrong. There will also, as ever, be puns. He explains how Portugal's invasion of Morocco in 1415 led directly to the 2014 World Cup; how the 1909 launch of an Austro-Hungarian submarine prevented Dr Zhivago from winning an Oscar; and the story of the black woman who refused to give up a seat on an Alabama bus and ended up changing the law - no, it wasn't Rosa Parks. Paul Sinha is an acclaimed stand-up who was nominated for the Edinburgh Comedy award for his show Saint or Sinha?. He frequently appears on The News Quiz, The Now Show, and Fighting Talk, and he is a resident 'chaser' on the ITV quiz show The Chase. He wrote and starred in The Sinha Test (2011) and The Sinha Games (2012) on Radio 4 and in 2013 had his own four-part series, Paul Sinha's Citizenship Test. Paul Sinha's History Revision was the winner of the 2016 Rose d'Or Award for 'Best Radio Comedy'.